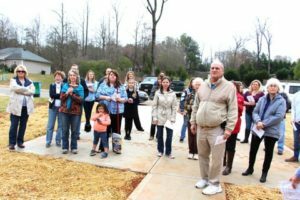 On a dreary Saturday morning in March, the Landrum Family gathered to celebrate the dedication of their new home. Joined by volunteers, friends, and family, the Landrum’s expressed enormous gratitude toward those that took part in building their home. Jessie and Star worked beyond their required 300 hours of sweat equity, showing their level of commitment and dedication. Jessie, being the perfectionist that he is, stayed at the house until 7:00pm the night before making sure everything was just right for his wife and daughter to see the next morning. It is inspiring to see a couple that works so diligently to create a better life for their daughter. Throughout the entire process, all Jessie and Star could talk about was how much their little girl would love the new home. 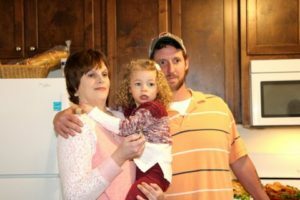 The Landrum’s have achieved their goal of giving their daughter a place to call home.